Friday 16 November, Norfolk VA: Leaving Norfolk, Virginia and USA. Day 1 of passage to Bermuda. It was a restless night, with very strong winds pushing us against the jetty and fenders squeaking and rolling up the hull. Glen having to go out a few times to reposition them. And the lapping on the stern …ooph, what a concert that was! So we feel not exactly rested this morning. And going to bed very late last night didn’t help either. Yesterday it was a full on day onboard, with a long list of things needed doing before we leave shore power and internet. Emails, banking, weather check, google research, update all gadgets and toys and charge their batteries, secure all items that might roll at sea, fill tanks with water, supermarket run to top up on fresh fruits & veggies (thank you Greta for driving us there). We’ve been pretty much busy till midnight. The big day has arrived, today we are leaving Norfolk and start the passage to Bermuda. Still blowing hard today and bitterly cold, but the sky is clear and the sun is out in its full warming glory. 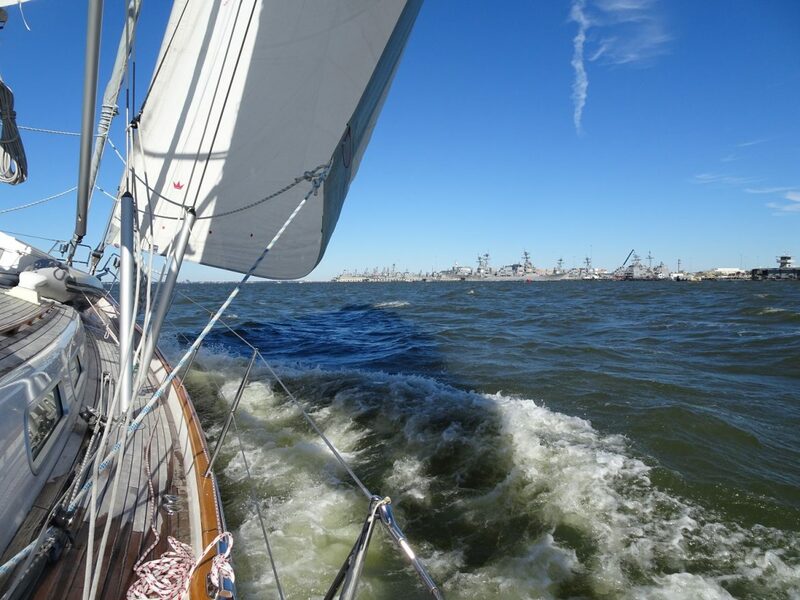 We should have a nice sail till out of the Chesapeake Bay and down the Virginia coast. Although we set alarm for an early rise, looks like we don’t have to rush our departure. The wind on the Atlantic shore is still strong till mid-day. On that note, I cook the lunch for today to have it ready. It would be a good idea not to have to be in the galley in rough seas, especially after we haven’t been sailing for a while. I took the seasickness pill last evening and again this morning, so I should be fine later on. Meanwhile, Glen takes print screens of PredictWind forecast for each day and plots way-points on the Raymarine with the key coordinates: entry and exit into the Gulf Stream, and transiting the eastern eddies. All items secured inside the boat, last pictures clicked, farewell has been said, and we are ready to slip the lines late morning. We motor for few minutes to the fuel dock in Tidewater Yacht Marina, where we top up with the precious boat juice. Looks like we are going to need it. Well either that, or slowly sail under asymmetric. I think I’ll vote for motoring. In the marina office we spot a pilot book on Cuba, and we buy that too. Odd, because all of Glen’s various searches he could never find a Cuba pilot … and here is one in a fuel shop! I guess we just decided we will be sailing to Cuba this season. Motoring out through the Port Norfolk Reach the wind is 20deg off the bow at 8-13kts. Glad we didn’t go for an earlier sail! We put the mainsail out to stabilize us, and we continue to have the eyes glued to marking buoys and boats coming in and out. Quite a busy channel this morning. And then, when we turn northwards and enough off the wind, we can sail! Bliss. Sailing passed the naval docks was quite an experience. They have an impressive collection of aircraft carriers, destroyers and auxiliary. Quite a sight! We almost ignore trimming the sails, being distracted by this huge array navy ships in the biggest navy dock in USA. Once passed over the tunnel we are dead downwind heading east so we furl the genoa away and gybe the mainsail. Sealed inside the cockpit and with the sun warming us, we feel quite cozy in our tent. It might be small, but we wouldn’t want one of those cockpit tents that look more like a family tent for 8! Around Cape Henry and officially into the Atlantic, the sea is surprisingly flat even with this offshore westerly wind. Hard to believe there were 50-60kts of wind blowing through here just yesterday. We only just see the swell. What we do see clearly is wind over tide creating patches of what looks like boiling water. But we are out of there in no time. There are lots of other yachts also sailing into the Atlantic. Looks like all the sailors are heading off today. What a delight! Let’s catch them all up! 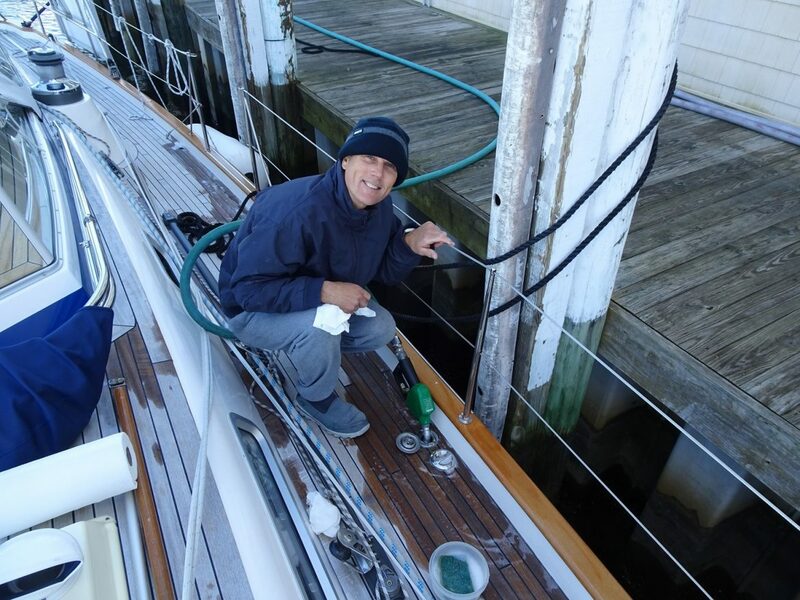 We look through the monocular and scan their inventory on the decks and the cleanliness of their hulls 🙂 And Glen’s comments are delicious, but not to be reproduced here. Brilliant broad reach as we are sailing SSE next to the coast. Wind stayed with us at 15-18kts, and we are flying along at 8+kts. Wish it were like this all the way to Bermuda. We have lots of fun on the deck, recording videos and monitoring the “competitors” to our port, as they gradually fall eastwards. At first they seem to all be sailing in a straight line to Bermuda, but later we realize they just didn’t cut the corner around Cape Henry like we did! And soon we are all headed in the same direction. We planned our route SSE first, till a point 20nm east of Cape Hatteras as an entry point to cross the Gulf Stream, at its narrowest section and also a lower flow rate. Get in wrong crossing the GS, especially if wind against tide, and you can have boat-breaking seas, apparently. The trick is to get across it as fast as possible. So as soon as the seas get lumpy we will turn due East. Very nice sunset, with beautiful orange glow in the sails and over the horizon. And once the sun is gone, the temperature drops immediately, chasing us inside the cockpit tent where we seal ourselves in… till we next need to go on the deck and look at the sails. Despite the forecast of wind dropping after sunset, it stays around 18nts. And now that it’s dark, Glen is of opinion we don’t really need to be doing 9kts SOG, and we reef the main. Surprisingly, even so we still do the same speed! Early evening Glen goes for a nap and I take the first “night” shift. Uneventful, still flying along at nearly 9kts with 1kt of current helping us. The forecast did show a strong eddy here along the coast. Let’s hope they are right about the rest of the eddies, after we cross the Gulf Stream. Glen is awake again 2 hours later. A deep sleep apparently. During his shift the wind has come aft 20deg so Glen eases the sails and we start to roll a bit. We are now 12nm off the coast and the waves are now bigger. There is an annoying creak at the end of the boom. Glen suspects the outhaul pully and sure enough, a quick teeek on the outhaul and the squeak is silenced … for now! Farewell USA, you have treated us very well. Beautiful sights, friendly and generous people, great ice cream. We are surely going to miss you and the many welcoming people we met here. We’ll be back one day.